Regina Steed-Ford never thought she’d become a full-time sailor. 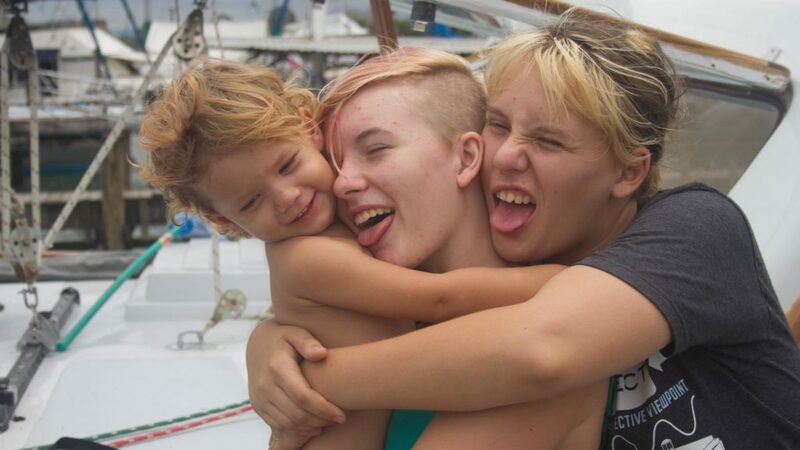 But that’s exactly what this 39-year-old mom and her family — husband, Alan, 44, and three daughters, Kali, 17, Lilith, 15, and Annalise Estel, three — have done by setting sail on a three- to five-year trip most of us can only dream about. Leaving the mainland behind was something Alan had always wanted to do, ever since he was a little boy. "We have lived on boat on and off for about 17 years," Regina tells Margaritaville. The couple even had their youngest, Annalise, on a boat. [caption id="attachment_5234" align="alignnone" width="900"] Regina with Alan and baby Anna. Photo credit: KrakenKissed.com[/caption] “We were in Maine at the time and I found it to be the most amazing experience to give birth within the comfort of my own sailing home, with people I loved,” Regina says. It was in fact Alan’s dad, Bill, who invited Alan, Regina and their children — a family of four living in Philadelphia at the time — to become the crew for his boat. For Regina, who is now making a documentary about her experiences called Kraken Kissed Adventures, learning to get behind the sailing life started when she read a magazine about people who had sailed their boats all over the world. “I fell in love with the idea of traveling like this,” she says. "The best part of this life is the freedom to travel without packing or unpacking." The worst? "The seasickness! It can be tough as the family can be at sea for up to three weeks." 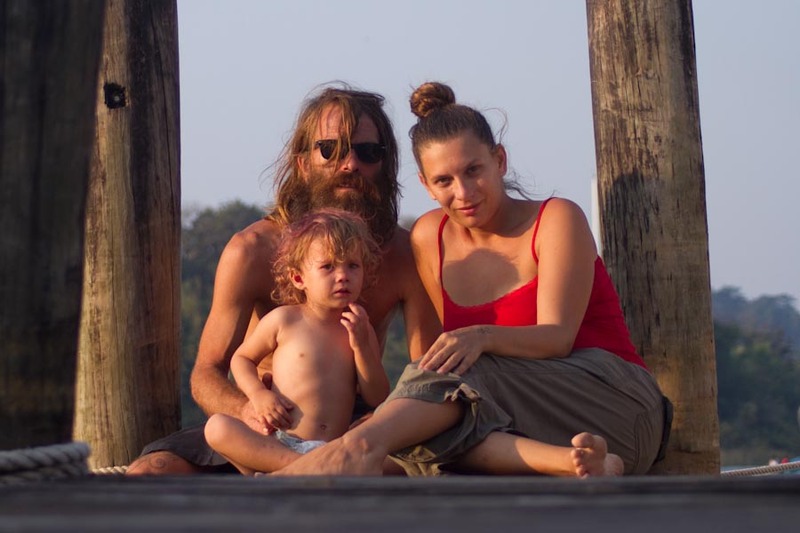 We caught up with Regina in Roatan, Honduras, an island off the mainland, where the family is currently docked, and she took us through a typical day in her family's unconventional life at sea. [caption id="attachment_5240" align="aligncenter" width="640"] Regina and Alan's three daughters: Annalise, Lilith and Kali. Photo Credit: KrakenKissed.com[/caption] On daily life aboard the boat: “When we’re docked, the adults wake up sometime around 7:00 AM. Alan and Bill sit outside, drinking coffee and talk about politics, boat work and project ideas. Meanwhile, I am usually working on videos about our trip, about the lifestyle, and about creating the life you want. I also spend time watching educational videos, answering emails, responding to comments and generally working on the business. Then, caffeinated and ready for the day, Alan starts working on his list of boat work that needs to be done (mainly installation and maintenance of the boat and its systems) and works on that off and on all day. I also help with the boat work where I can, all while minding Anna and trying to handle some basic things like tidying up (which is a constant battle with so many living in tight quarters)! In addition, we all (minus the toddler) are crew and we're expected to help handle sailing the boat. On life for Lilith AKA Lily, 15: “Lily helps with boat work whenever asked, though she would happily avoid it and play video games all day. Her day is spent back and forth between her own time (for games, reading, swimming) and helping with chores. She also enjoys learning with Khan Academy videos.” On what it’s like to learn on a boat: “Lily is homeschooled. Anna basically is, too, though she’s not of school age. We practice ‘unschooling,’ also known as child-led learning. Basically this means we pursue the interests of the child and teach them how to teach themselves what they want/need to learn. This is the best adventure we could ever imagine!” On late-afternoon family-time: “Around four or five PM, we have an early dinner, we try to finish up the projects that we’re doing that day and spend some time together. Alan, Anna and I love going for kayak rides and exploring.” On living life ruled by the clock—and the weather. “Each person, (except for Anna), has their turn driving/sailing and being on watch. They’re usually about four hours long and run 24 hours a day, since we travel 24 hours a day. We haven’t come up with much for a day to day routine yet for travel days other then the watch schedule!” On rising above any negative feedback. “Most of the feedback we’ve gotten about the trip has been good. But the ones that aren’t can be really bad. We’ve had people tell us that we should be ashamed of ourselves. I try to address anything that seems like they’ve gotten wrong, (as sometimes people are making judgments with very little information). However, for the most part, I really try to ignore the negativity. I know that when people pursue what they want, no matter what it is, some people will try to tear that down.” The family had been living in Key West prior to setting sail on their current trip, says Regina, who explains that they "will be on this trip for an estimated 3-5 more years, though it could be longer or shorter depending on things go." Certainly, they've encountered unexpected situations along the way. "On this trip, we started in Key West, but got shipwrecked in Mexico," Regina says. "Then we took buses from Mexico through Belize and down to Guatemala. Then we sailed with Alan's dad from Rio Dulce Guatemala, to Roatan Honduras, and that's where we are now, waiting for the end of hurricane season." That's when the crew will head to Panama to go through the canal and make their Pacific crossing. For more on what's next for Regina and her family, follow them at krakenkissed.com.